We’ve arrived at Prince Albert National Park in Saskatchewan! The first few days on the bus have definitely been busy and exciting. I’ve already become notorious for neglecting to check where I’m stepping and falling in holes while chasing after insects in the bog. After getting my boots flooded a few times and muddying up my socks, my fellow BIO-busers have kindly started reminding me to watch for holes. When I’m not knee deep in mud, I’ve had the chance to catch glimpses of cool wildlife, like elk and black bears. One black bear in particular has taken to destroying a malaise trap we have set up in the park for the summer. I guess the combination of dead insects and ethanol is hard to resist. The bear was so persistent that today we decided to protect the new trap by setting up an electric fence. 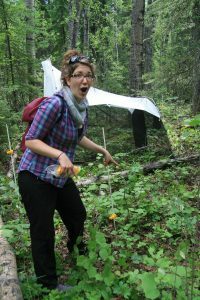 Rod Thompson, Ecosystem Geomatics Specialist at Prince Albert NP, got us to help him set up the fence around our malaise trap which was a new experience for all of us on the bus. Hopefully that will deter the bear from snacking on our insects in the future. We also helped set up a motion sensitive camera that will catch the bear in action if he does decide to return!